JungleWatch: APURON: "HOLY FATHER, I WANTED TO SEE YOU BEFORE DYING." APURON: "HOLY FATHER, I WANTED TO SEE YOU BEFORE DYING." Another report from La Stampa. Highlights, mine. Comments in red, mine. “Holy Father, I wanted to see you before dying.” Arriving at the Paul VI Hall in a wheelchair * due to health problems, Msgr. 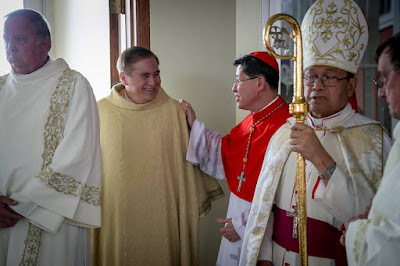 Anthony Apuron, the Archbishop of Guam suspended amid abuse accusations, greeted Pope Francis at the end of the general audience on February 7th. Bergoglio reacted with affection, shaking the bishop’s hand and privately giving him a few words of encouragement. Apuron had recently undergone surgery, as he revealed in a statement released in the last few weeks breaking his silence concerning the accusations of sexual abuse against minors first made against him in June of 2016—accusations which forced him to suspend himself as archbishop of the Pacific island while a canonical trial was initiated. “As I lay sick after another surgery and I face the final judgment approaching evermore close, having lost interest in this world” reads the statement, in which the prelate specifically responds to the latest accusation from his nephew Mark Apuron, who in an interview with a Guam news outlet described an alleged assault in the bathroom of his uncle’s house during a family dinner. The incident, according to the man, happened sometime around 1989 or 1990. With that of Mark Apuron—a relative from a part of the family rarely frequented by the archbishop, according to what he’s told his closest associates—the number of accusers now stands at five. The other four are former altar servers who claim they were abused at Our Lady of Mount Carmel parish in Guam, where then Fr. Apuron was pastor. Accusations from which have emerged some contradictions and incongruences in the course of the process conducted by five bishops and overseen by American Cardinal Raymond Leo Burke, whom the pope sent to the island to investigate the case. Meanwhile the situation on the island—famous for its natural beauty, evangelized nearly four centuries ago and with a 95% Catholic population—has changed radically. The Church has been hit by a wave of abuse accusations against clergy and Church employees following the senate’s passage of a law removing the statute of limitations for sexual offenses. A dramatic escalation of sexual abuse accusations—more than 95 in the last year and a half—with substantial claims for financial reparation from the diocese. Some of them accuse priests in their nineties or ones already deceased. "Our Church is headed for bankruptcy and towards destruction,” a priest in Guam tells Vatican Insider. Another shock to the fabric of the Guamanian church has been the Dec. 15 closure of the Redemptoris Mater seminary and the theological institute affiliated with the Pontifical Lateran University, where just a year ago 48 seminarians were studying for the priesthood, a number that had been projected to rise to 80 after other dioceses in the Pacific had announced plans to send their seminarians to study in Guam. The decision was announced by the coadjutor archbishop Byrnes, who explained that the seminary’s model was “unsustainable” for the island. But the prelate also acknowledged plans to sell the beachfront property in Yona—which has attracted the attention of foreign developers in the past—with the intention of helping cover the costs of out-of-court victim settlements. Many of the seminarians, among them several local vocations, have relocated to other dioceses or returned to their home dioceses. Some had finished their studies and were awaiting their ordination to the diaconate. With the closure of the Theological Institute—whose establishment was requested by 31 bishops of the Pacific in 2005—twelve professors returned home, including some educated at the Lateran. The question of the seminary and the institute has interested the ranks of the Holy See, including the Secretariat of State, for example, and Cardinal Fernando Filoni, prefect of the Congregation for the Evangelization of Peoples—under whose jurisdiction the archdiocese of Guam falls. The cardinal sent a personal letter to Bishop Byrnes after having received a letter from four priests of the archdiocese of Agaña expressing concerns about the planned closure of the seminary and the Institute (the priests were expelled from the diocese’s presbyteral council for “insubordination” soon after). In his letter, the prefect of Propaganda Fide reminded Byrnes of the Church’s interest in not selling the property and the prohibition placed on alienating the property based on previously stipulated conditions. 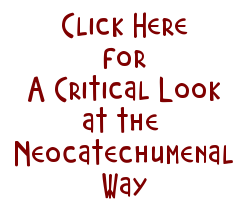 The document was intended to be a private letter but was obtained by a local blog known for promoting accusations against Apuron and the Neocatechumenal Way, an ecclesial reality with a strong presence in Guam. During a general audience in October 2017 in St. Peter’s Square, a canonical recourse signed by approximately 25 priests, lawyers, and other prominent figures from Guam was hand-delivered to the Pope. The signers appealed to the Pope to personally intervene regarding Byrnes’ decision, which, it read, “has inflicted a spiritual, moral and physical harm upon the faithful of Guam as a result of his actions without respect for canon law.” The appeal --multiple sources report-- is currently under review by some dicasteries of the Curia. Besides closing the Redemptoris Mater, Byrnes has meanwhile reshaped the diocese’s bodies, replacing the members of the cemetery board, the presbyteral council, the finance council, the college of consultors and the metropolitan tribunal. 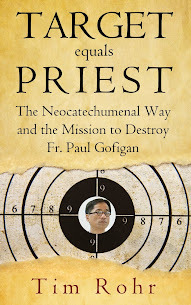 His dismissals include several Chamorro (the name given to local natives) priests as well as those affiliated with the Neocatechumenal Way, and in the case of the tribunal, replacing them with—among others—clergy from the Philippines. Reinstated to all the advisory boards was the controversial Msgr. James Benavente, whom we reported on in the previous article. The latest string of appointments came just a few weeks after an hours-long visit by Filipino Cardinal Luis Antonio Tagle to the island on Dec. 17, 2017. Cardinal Tagle was the guest homilist at Msgr. Benavente's 20th anniversary Mass. Apuron "looks" on. Apuron's visit and the article in La Stampa were set up by the Neocatechumenal Way as a way to discredit Archbishop Byrnes in a national Italian publication. The author, Salvatore Cernuzio, is a member of the Way who regularly writes for Zenit and even writes posts for the Way's official website. Their plans will backfire.